Dr. Goosey has performed thousands of cataract surgeries using the most advanced surgical technology available today. As a cornea specialist and skilled cataract and refractive surgeon, he helps patients understand why and how cataracts develop. He also explains that cataracts naturally occur when there is clouding of the normally crystalline lens of the eye, caused by the aging process, metabolic changes, injury, various forms of radiation, toxic chemicals, and certain drugs like steroids. Cataracts are the leading cause of vision loss among older adults, impairing vision, and making everyday activities increasingly difficult. The condition can be compared to a window that is dirty or “fogged” with steam. The good news is that there has been a swift evolution in cataract treatment over the past few years, significantly improving visual outcomes with faster recoveries. 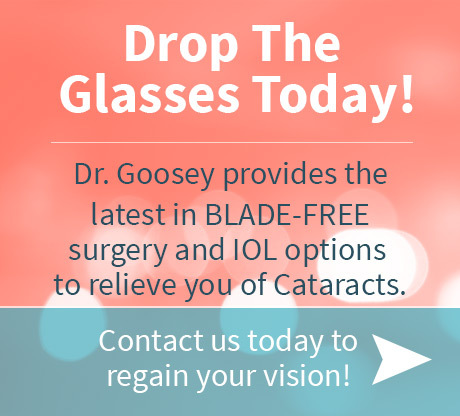 Most importantly, Dr. Goosey’s practice is one of the very few that has consistently incorporated the latest advancements in laser-assisted, blade free cataract surgery. This undoubtedly places him in an elite group of physicians in the country, and only one of a few in Texas, that offers the most advanced technologies available. Whether patients need cataract surgery, or are looking to implant new intraocular lenses for improving their vision, the technologies available with Dr. Goosey are the most advanced anywhere. Phacoemulsification is how most traditional cataract surgeries are conducted today. This form of micro surgery in which the eye’s internal lens is emulsified with an ultrasonic hand piece tool for aspiration of the eye. Aspirated fluids are replaced with surgical fluids of balanced salt solution that helps maintain the anterior chamber of the eye. Being a delicate organ, the eye requires extreme care before, during, and after a surgical procedure. However, with the introduction of “blade free cataract surgery,” the time needed to use the phacoemulsification technique has been dramatically decreased, allowing a much faster recovery for the patient. Like a fingerprint, every eye has a unique size and shape. Prior to treatment, the CATALYS® System images your eye and makes precise 3D maps of relative structures inside the eye. This enables Dr. Goosey to create a tailored treatment plan that is customized for your eye. Dr. Goosey can use the CATALYS® System to create a perfectly sized, shaped, and centered circular opening to access and remove the cataract. This precise incisionhelps your surgeon place a new artificial lens precisely where intended. Clinical studies have shown that this opening is approximately 10 times more accurate when performed with the CATALYS® System than was achievable by hand. As a skilled refractive surgeon, Dr. Goosey can use the laser to soften hard cataracts. Softening the lens with the CATALYS® System laser enables him to remove the cataract and more gently and with significantly less ultrasound energy than is used in traditional cataract surgery. This means less downtime, and a faster visual recovery for the patient. Many patients may go back to work, or resume normal activities the next day. Nearly 99% of the cataract surgeries performed each year are completed without serious complication. Lens exchange is the most common procedure performed in the United States, with over 3 million performed each year. Due to surgical technology, cataract surgery has a 98% success rate, the highest success rate of any surgery performed in the US. Cataract surgery usually takes less than 30 minutes. The laser portion of treatment usually takes no more than just a few minutes. You can expect little or no discomfort during treatment or after surgery. You will be given an intravenous injection of Versed (midazolam) to help you relax for the procedure. The eye is also numbed with topical drops throughout the procedure. During the laser portion of the surgery, patients describe seeing a kaleidoscope of lights. Most patients resume normal activities the next day. And your vision may continue to improve over the next several weeks. You should have little or no discomfort while recovering from your procedure. The most recent technological advancement used by Dr. Goosey is the CATALYS® Precision Laser System from Abbott Medical Optics. The CATALYS® System utilizes Femtosecond laser assisted cataract surgery technology, that offers a reproducible, noninvasive technique which replaces the least predictable and most technically demanding steps of conventional cataract surgeries, and ultimately improves post-op recovery. With the introduction of the blade-free laser cataract technique, patients are gaining their new stellar vision at a much faster rate than with the traditional surgical technique. With the CATALYS® System, we can provide the most sophisticated cataract removal procedure in the world. This innovative laser assisted surgical technology allows for a much safer, gentler, and more accurate outcome from cataract surgery. Dr. Goosey is one of only a few physicians offering the use of Laser technology to improve the surgical procedure to replace an IOL; and Houston Eye Associates is proud to be just one of two practices in the Houston area with this state of the art laser technology! Dr. Goosey also uses the ORA™ System from Alcon®. This surgical system is a revolutionary diagnostic device designed to maximize the accuracy of the intraocular lens selection during surgery. The ORA™ System uses an intraoperative Wavefront aberrometer and analyzer to more accurately measure the eye’s unique optical characteristics and assess its focusing capabilities. An astounding 90% of the lenses selected by the ORA™ System are within a half diopter of their intended target. The bottom line is this: When Dr. Goosey uses this system for cataract removal, the innovative surgical technology insures that the IOL selection is as accurate as possible. On top of advance surgical technology, there is also the latest in lens technology to support vision after surgery. Dr. Goosey implants the most advanced Intraocular Lenses available today, including the popular “multi-focal” IOL options. There are many IOL options available for patients with cataracts or a desire for a clear lensectomy procedure. Today’s IOL options are highly advanced and include multi-focal solutions correcting various vision problems. Toric IOL options are utilized for astigmatism and other visions problems. For those who desire to correct one vision problem, mono-focal IOL’s are also available. Call 281-407-9062 for an appointment! What Is Great Vision Worth? During cataract surgery, Dr. Goosey will replace the cloudy natural lens (or cataract) of your eye with an artificial intraocular lens (or IOL). But first, you and Dr. Goosey must select the IOL that is right for you. Dr. Goosey is pleased to now offer patients the new TECNIS® Symfony IOL Multifocal Lens technology, which ultimately provides high-quality vision at all distances. With advanced technology IOL’s, like multifocal lenses, the true beauty is that patients can usually achieve clear vision at far, intermediate, and near distances, often with little or no need for glasses. You can even correct many other vision problems outside of cataract removal, such as nearsightedness, farsightedness, astigmatism, and presbyopia. “Standard”, or monofocal IOL’s, on the other hand, can eliminate cataract problems and provide clear vision at a distance. However, you will still need glasses to see at intermediate and near distances. Standard cataract surgery is covered by Medicare and most commercial insurances. Dr. Goosey offers special 0% interest financing through CareCredit for multifocal lens; and if you have a “flexible spending account” (FSA) as part of your healthcare program, you can also use the pre-tax funds to help pay for your copay and upgraded lens. Learn more about our financing and payment options. But, besides considering the costs of an advanced technology IOL, it is imperative to look at the potential benefits of these lenses as well. Instead of spending thousands of dollars on glasses and contacts throughout the rest of your life, cataract surgery with an advanced technology lens is a one-time investment that can permanently correct your vision. You will only get cataracts once in a lifetime, make sure you choose the option that will allow you the lifestyle that you have always wanted.